DETROIT—”I think the show was fantastic. The lines of the dances were unbelievable, and the acrobatic tumbling part was amazing. 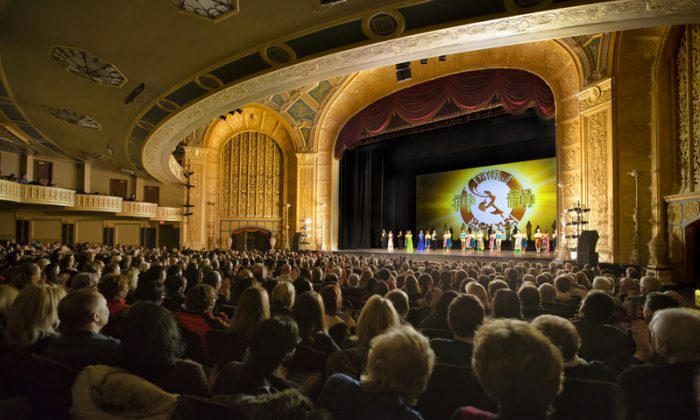 I loved it,” said dance instructor, Karolyn Leibovitz after attending Shen Yun Performing Arts’s evening performance on Feb. 7, at the Detroit Opera House. Accompanied by her husband, Arie, the 44-year veteran dance instructor who holds a ballet degree from Butler University in Indianapolis, was at a loss for words when asked to describe the choreography. “There are no words to express how I feel about this show. The choreography was amazing. I don’t know a word to express how I felt watching the dancers move in and out of formation, and we had terrific seats so I could see everything with the choreography,” she said. Shen Yun is a New York-based dance and music company that endeavors to revitalize traditional Chinese culture. “Chinese dance is at the heart of what Shen Yun does. Known for its incredible flips and spins, and its gentle elegance, it is one of the most rigorous and expressive art forms in the world,” according to the company’s website. “They make it look simple and easy, and it’s so difficult and so hard to do, these movements, in and out of formation, staying together as a group—just took my breath away,” she added. Finally, Mrs. Leibovitz noted how well the orchestra and the dancers were able to synchronize, creating a harmony between what each performer was doing and the story being told. Piano Teacher, Sarah DePalma, was also in attendance for Shen Yun’s evening performance on Feb. 7, and she noted something similar. “The music reflected the themes so well. If it was (an) elegant, beautiful theme, the music was beautiful. [In] the aggressive type themes, the music was more aggressive. It coordinated very well,” she said. “The orchestra was phenomenal with the traditional instruments, Chinese, and the Western. It was beautiful. I enjoyed that orchestra very much. I think it’s unique and very fascinating,” she said. Shen Yun’s orchestra is a unique blend of traditional Western and Eastern instruments.